I wrote the following report back in 2007 with Robin Goad of Hitwise, so thought it would be fun to look at it now – six years later, to see how close we were to the truth. As with most predictions, some have been slow to pass, but I like to think we weren’t that far off the mark.. The big three social networks accounted for 85% of UK Internet visits to a Hitwise custom category of the top 25 social networks in October 2007, but there are lots of other competitors competing for users. These range from generalist sites, such as Friends Reunited and Faceparty, to more specialist sits such as Club Penguin (a social network / virtual world for young children), Neopets (a virtual pet community) and Linkedin, (a professional networking site). The market is moving rapidly, and there is no certainty that today’s hot property will still be leading the market tomorrow. Facebook increased its market share forty-fold between October 2006 and 2007, and social networks users’ loyalty cannot be taken for granted. There is also a lot of traffic between social networks themselves – for example, in October 2007 MySpace received 7.6% of its traffic from Bebo, and returned the favour by sending 4.7% of its traffic back. Social networks have grown rapidly in the UK over the last few years and their share of total UK Internet visits more than tripled between November 2005 and October 2007. As a social networks expand their subscriber bases the network effect kicks in, and the average time users spend on them increases as their number of friends / contacts increases. For example, Bebo tripled is market share of UK internet visits between February 2005 and 2006, and at the same time its average session time increased from 6 minutes 22 seconds to 21 minutes 32 seconds. Consequently, social networks now receive one in every five page impressions in the UK – more than any other category of websites, including Search Engines and Shopping and Classifieds. Social networks are also starting to eat into the email’s dominance of the internet messaging market. A growing proportion of the UK online population is choosing to communicate with friends via social networks rather than email. This is nicely illustrated in FIG 1, which shows that in October 2007 Internet visits to social networks overtook visits to web-based email services. 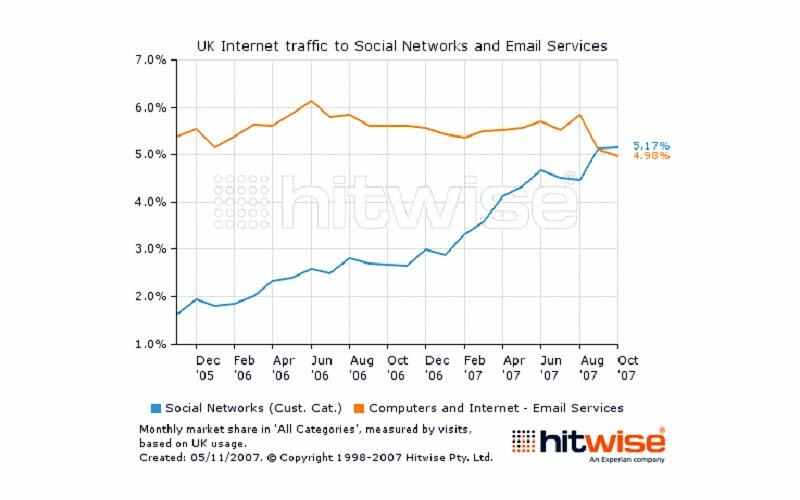 A Hitwise custom category consisting of the top 25 social networks accounted for 5.17% of all UK Internet visits, compared to 4.98% for Computers and Internet – Email Services, which includes Hotmail; Yahoo! Mail and GoogleMail, amongst others. Younger users are currently more likely than their parents’ generation to use social networks in place of webmail services for online messaging. For example, in October 2007, 62% of Facebook users were aged 34 and under, whereas 55% of visitors to Windows Live Hotmail, the most popular webmail service in the UK, were older than 34. However, when you look at overall usage of social networks, the age gap is closing rapidly. As FIG 2 illustrates, the proportion of visitors to Hitwise’s Social Networking and Forums category (which is dominated by the social networks) aged 55+ increased from 9.3% to 15.3% between October 2006 and 2007. In addition to participating in the more established social networks, older users are also carving out their own niches online – so much that Saga group recently launched SagaZone, a social network for the over 50s. With 1.8 members in November 2007, the London Facebook network was larger than both Toronto (1.0m) and New York (0.6m) – in fact it was the largest Facebook group in the world. While this illustrates the popularity of social networks in the UK, it also leads some people to believe they are primarily used by a ‘metropolitan elite’. However, this perception is incorrect. For example, the Manchester Facebook group had half a million members (a higher proportion of its population than London), while there were 0.2m million in Bristol. In fact, Internet users in Wales, Northern Ireland and Scotland and are actually marginally more likely to visit a Social Networking and Forums site than someone from London or the South East. 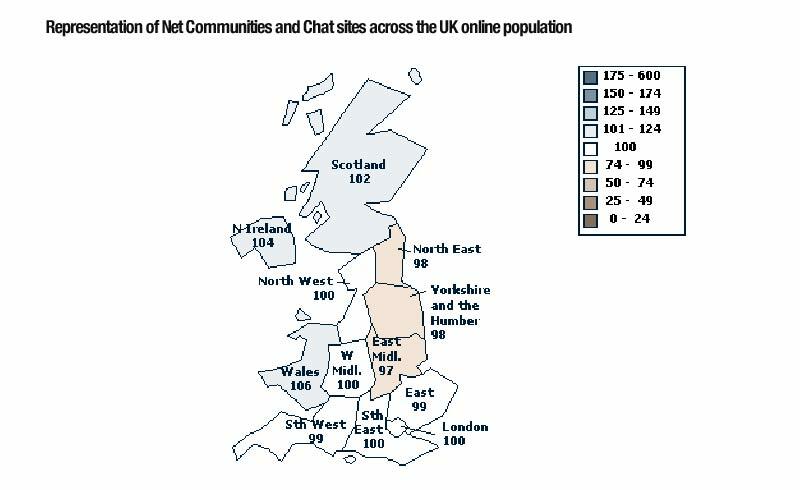 As FIG 3 illustrates, visitors to Social Networking and Forums sites closely represent the online population as a while, with no one region particularly strongly over-represented. In much the same way that the emergence of eCommerce provided people in more remote communities with a wealth of new shopping opportunities, so the growth of social networks has enabled people across the country to communicate and participate online more effectively. Social networks account for an increasing proportion of UK Internet visits, and they are also becoming an important source of traffic for other sites. 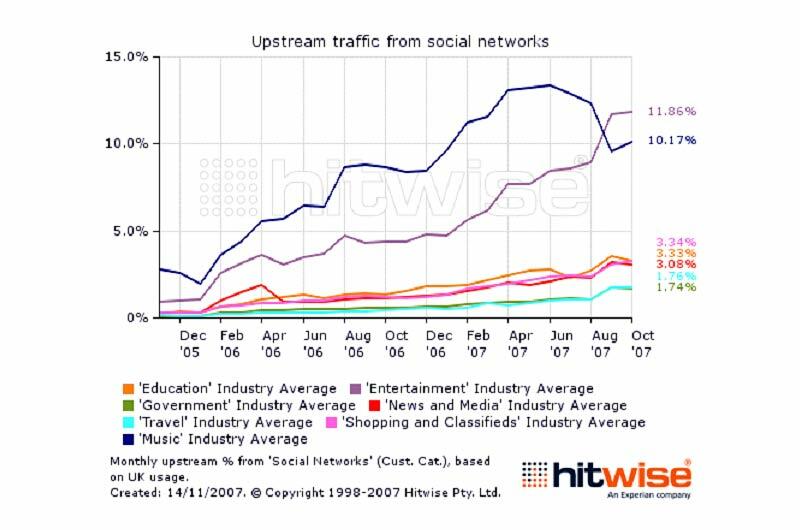 In October 2007, Social Networks accounted for 7.7% of upstream internet traffic to all other sites, making the category the second most important source of traffic after search engines. As FIG 4 illustrates, the close links between social networking sites and the entertainment industry meant that music, film and TV sites were amongst the first to realize this potential. More than one in ten visits to the Entertainment and Music categories in October 2007 came from social networks, with Bebo the second most popular source of traffic to the latter category after Google UK. Music and Entertainment were early adopters but, as FIG 4 illustrates, the potential to win traffic from social networks cuts across all industries, from Government and News and Media, to Travel and Shopping and Classifieds. The amount of traffic that Shopping and Classified sites receive from social networks increased ten-fold between November 2005 and October 2007. Within Shopping and Classifieds, the five largest retail sub-categories to receive traffic from social networks are Auctions, Department Stores, Apparel and Accessories, Music, and Video and Games. The growth in traffic from social networks to other sites is a result of a number of factors, some of them ‘organic’, and some of them down to clever marketing. The earliest examples of successful social network marketing are typically more organic or grass roots, whether it’s the Artic Monkeys building a following via MySpace or 14,000 people successfully campaigning for the return of the Cadbuy’s Wispa on Facebook. This first wave was then followed by a second wave of more organized campaigns – some from a grass roots level, some with a certain amount of guidance from professionals. The success of Lilly Allen via MySpace with some help from the record industry is a good example of the latter, while the Primark Appreciation Society on Facebook is a famous example of the former. The group, which in November 2007 had over 100,000 members, acts a space online for fans of the discount fashion retailer to share recommendations with friends, discuss the latest shop openings and highlight current bargains. The growth of social networks shows no sign of slowing, so it’s not surprising that every website wants to take advantage of the sector’s phenomenal growth. Unfortunately, the reason that people are attracted to social networks in the first place is that rely on user-generated content and are seen as relatively free traditional corporate content and advertising. If users perceive that that social network is getting ‘polluted’ they will leave, and the evidence suggests that this can happen extremely quickly. Therefore, the onus is on the social networks themselves and the websites wishing to gain traffic from them, to design marketing campaigns that fit in with this philosophy. The two examples that follow demonstrate that a successful social network marketing campaign can work from a ‘top down’, rather than organic grass roots, perspective. Social networks in 2008: what does the future hold? Social networks have grown at a phenomenal rate over the last three years, and the market showed no sign of slowing down during 2007. In fact, the rapid growth of Facebook meant that the market grew even faster in 2007, and not just in terms of total internet visits. More importantly, the reach of social networking sites increased significantly during 2007 – they now attract a much wider range of users in terms of age, interests and social background. The functionality of social networks has also improved, with the rapid growth of communications via social networks, applications, and commercial opportunities. So what role will social networks play in 2008? The simple answer is: a bigger role than ever; which is why no company, government or NGO can afford to ignore them. More specifically, there are a number of key areas where there will have a significant impact in 2008 and beyond. Social networks will become the dominant channel for viral marketing campaigns – email has been the dominant channel for viral marketing campaigns since the mid 90s, but social networks will overtake it during 2008. The most successful viral campaigns in 2008 will incorporate both social networks and email, but with an emphasis on the former. However, because there is already a lot of ‘clutter’ in social networking sites, viral campaigns will really have to stand out from the crowd to be successful. Social networks will become the primary arena for highly targeted marketing and advertising – search marketing has been successful because it allows advertisers to target their message based on search behaviour. A plumber that only operates in Liverpool can choose to only have her adverts displayed when someone is searching for a plumber in Liverpool, for example. Social networks know much more about their users than search engine and traditional portals. They could, for example, choose to show an advert only to men who live in Leeds, are aged between 34 and 55, and enjoy Italian food. However, both the advertisers and social networks will have to manage this wealth of information correctly. There will be the usual privacy and security concerns, as well as the challenge of maintaining the fine balance between commercialisation and community, particularly when it is so easy for users to switch allegiances. Finally, there is the need for the social networks to maintain a reliable database by creating the atmosphere that encourages people not just to share information about themselves, but to do it truthfully. Consumer power will manifest itself through social networks – the internet provides a global forum for consumers to vent their anger when they are wronged by corporations or governments. The growth of user-generated content, blogs and video upload sites have all helped give people a voice online, but social networks add an extra dimension. Previously consumer campaigns relied on luck or clever marketing to ‘go global’, but social networks provide the perfect forum for campaigners to build a support base within a matter of days. There have already been some notable examples of successful consumer campaigns organized via social networks, and there will be many more during 2007. Specialist social networking sites will grow, but not at the expense of generalist sites – a lot of companies, organizations and start ups will inevitably jump on to the social networking bandwagon. Many will fail, but some will become popular, and successful specialist sites built around distinct communities (where interest groups, age groups, locations or anything else) are bound to emerge. This is unlikely to lead to a fragmentation of the market – smaller specialist communities will often rely on the larger more generalist communities to pick up traffic or for functionality. There is already a lot of traffic between social networks and this will not change – it will become vital to maintain a presence on the major social networks as well as the most relevant niche players. Social networks will improve their functionality, particularly search – Social networks contain a huge amount of content, but it can be very hard to navigate around them or find specific information. Social networks will need to improve their search and navigation capabilities if they are to become a more usable source of information, and these improvements will go hand-in-hand with more targeted advertising capabilities. Internet Privacy will force social communities to serve more relevant brand communications – the internet privacy debate is heating up in the US, as consumers become jaded at the volume of pop-ups and banner ads they receive. An internet version of “Do not call” is being muted likely to be called a “Do not track” list. However this indicates two different concerns about consumer privacy. Firstly the concern that a user’s personal information is being collected and then shared with third parties to monetize the value of such a rich source of insight and provide a much higher quality of user information for targeting. Secondly, that the volume of ads being served are distracting and undermining the user experience when interacting on-line. However, the second of these concerns provides justification for increased tolerance of the first. Provided the information collected is stored and used responsibly, then brands will need to use it wisely to ensure users are not spammed and that messages are relevant and indeed valuable. If 2007 taught brands anything it was not to treat social networks like just another online marketing channel. Social media marketing divided brands into two camps. Those that managed to get it right (often through chance rather than design) and those that, for the most part got it wrong. In 2008, we believe that social media marketing will gain significant momentum – fuelled by sharp marketing techniques and insight. The majority of efforts up to this point have been little more than exercises in carpet-bombing. One-to-many marketing messages sit firmly within brands’ comfort zones – from the banner ad to the ubiquitous and much maligned pop-up – as the route one attempts to monetise user generated content. In our opinion, these will slowly become the exception rather than the rule, as brands recognise that social media marketing is a far more subtle, but highly effective, affair. Increased social media diversification: anticipating and responding to rapid changes in the social media hierarchy. The emergence of ‘super’ brand advocates: creating the framework to identify, engage and influence a new breed of key stakeholders. Using ROI to direct social media spend: using centralised data intelligence to make the right social media marketing decisions. New social communities and blogs are forming every day, creating a bewildering range of opportunities for marketers. The big challenge in 2008 will be knowing how and when to back the right social network winner and then executing their strategy accurately and at speed. The group-dynamics underpinning social community membership dictate that when people are time-poor they will contribute to the communities that best maximise their personal needs. They will be very selective about which communities they join and switch to the next site that fulfils their needs if a site does not live up to their expectations. Where last year people spent time getting used to these sorts of sites, this year they will become far more discerning about the ones they join. In terms of reputation management, the very nature of these active rather than passive sites attracts consumers who will naturally be the most vocal on the largest and most influential communities. Marketers need to make it their business to monitor and participate within these key sites. Good (and bad) news travels fast, but always gets aggregated on a few major communities appealing to these people’s interests. Keeping an active eye on these forums can forewarn a brand about any storms brewing or lucrative opportunities. Understanding the interaction between social media communities is just as important as understanding the interaction between the members within these communities. Viral messaging is akin to lighting a fuse within the social media world. Word-of-mouth contact is the life-blood for any social community and having something interesting to say or share raises the profile of individual members. Marketers need to identify each social network’s ‘heart’ and which communities are known for being trusted and providing useful and interesting content. So whilst the variety of social networks will continue to grow, marketers will need to become adept at identifying the heart and key arteries through which communication and information flows. In 2008, marketers will need to identify these ‘feeder’ sites and intelligently introduce their own presence into the community and use it to carefully communicate macro and micro messages to their target audiences. Nurturing brand advocacy tends to be based around textbook one-to-many marketing. The rationale is that by winning greater quantities of brand advocates this will result in greater individual customer spend, better retention and more reference based acquisition. However, the marketing textbook needs to be ripped up when it comes to social media. In 2008, we believe that we will see the emergence of the ‘super advocate’. Whether via a personal blog or as a key member within a community, super-advocates are well informed, opinionated and have the ability to make or break a product launch or ruin a hard-earned reputation. Identifying, engaging and influencing super-advocates requires extreme care and recognition of the power held by consumers in the Web 2.0 age. Super-advocates reflect the needs of members within these social communities. Just as in the off-line world where newspapers or media channels gain a loyal and trusting audience, who value their opinion and perspective, the same is true within social media. These individuals personify citizen journalism – outspoken, articulate and with a die-hard following. When they speak, members listen. Removing the marketing spin and telling things for the way they are, is an important asset that draws many members to these communities in the first place (especially the special interest communities). Marketers in 2008 will need to build into their strategies a scalable framework for working with super-advocates. The key to this will be providing them with exclusive benefits and respecting their role within their communities. By carefully courting super-advocates marketers will be able to use them to successfully disseminate information in a fraction of the time it would take them to do via their own social media presence. One word of caution, super-advocates will be high maintenance because they know that they hold all of the cards and if badly handled, brands will have an influential detractor on their hands. Marketers need to be prepared to bend over backwards to keep these key influencers onside and set aside marketing budgets to court them. The social media landscape is vast and growing every day with emergence of new sites and communities. Marketers simply cannot afford to close their eyes and hope for the best when it comes to achieving a return from their social media marketing investment. For the vast majority of marketers, social media marketing is uncharted territory. The traditional marketing rules simply do not apply in this environment. The good news is that hierarchies are already forming within the social communities, which will provide a more effective channel to convey acquisition messaging, gather insight and manage a brands’ reputation. However, these strategies will differ for each brand and marketers will need to optimise their actions appropriately. Measuring the value of their actions through tracking and analytics, then using this knowledge to direct their subsequent targeting and messaging will be a key focus in 2008. The potential returns from reputation management and research and insight will soon be greater within the social media than any other channel. However, to capitalise marketers will need a clear dashboard in order to guide strategic activities. Going in blind is an absolute no-no. The basis for any dashboard is powerful data intelligence. It enables marketers to understand which social media communities are driving the highest returns and allow investment levels and activities to be fine-tuned against the best performing sites. In many respects, the dashboard acts as a 24-7/365 campaign management system. Communications can be tailored to elicit the best response and positive and negative brand endorsements closely monitored around the clock. Marketers serious about social media marketing cannot afford not to use a value scorecard/dashboard in 2008. It will become invaluable as brands strive to understand the subtle and not so subtle undercurrents behind social media’s ebb and flow and target their investments for maximum impact. Trip Advisor is an online travel community that contains information about and 10 million user generated reviews of 270,000 hotels and tourist attractions around the globe. The company developed the ‘Cities I’ve Visited’, a Facebook app, which enables users to create a personalized travel map highlighting all of world cities that they have visited, are planning to visit, or would like to visit. The application also allows users to take a travel quiz, share travel stories and view or rate attractions. The application was great success and, during November 2007, had over 130,000 daily users. Before the application, Trip Advisor received very little traffic in the UK from Facebook, but once it gained popularity this figure increased significantly, and by November 2007 almost one in every ten visits to Trip Advisor came from the social network. 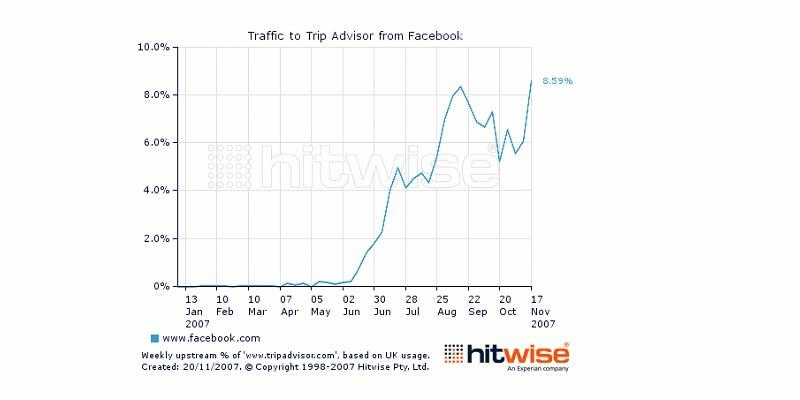 The application was also attracting new visitors: three quarters of traffic to Trip Advisor from Facebook was new visitors, compare with just one third from Windows Live Hotmail. The Royal British Legion created a Poppy application which allowed users to display a poppy on their Facebook profile as a mark of respect. 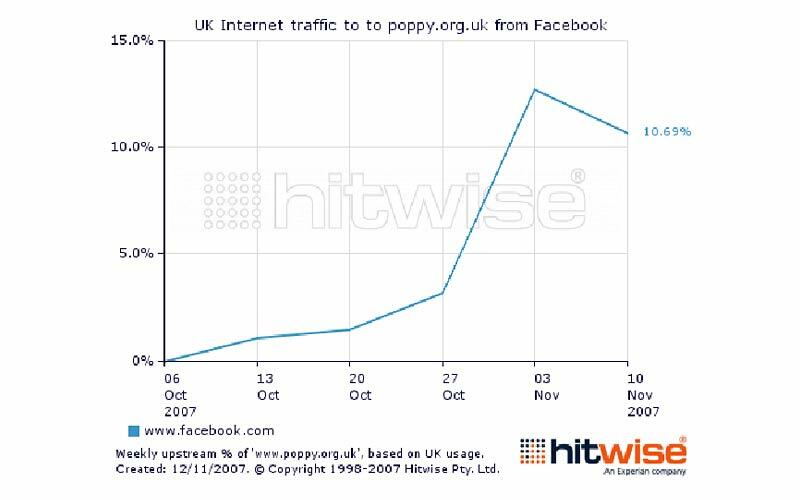 While the British Legion’s main homepage received less than 2% of its traffic from Facebook during the campaign, the micro-site it set up specifically for the Poppy appeal (poppy.org.uk) received over one in ten of its visits from the social network. The two most popular sites visited after poppy.org.uk (which together received over half of all downstream visits) were the British Legion’s homepage and poppe.poppy.org.uk, the section of the Poppy site that is used to collect donations. In addition, 94% of visitors that came to the British Legion site from poppy.org.uk during the busiest week were new visitors. In other words, the poppy site was delivering fresh traffic to the British Legion, rather than simply returning visitors. The final benefit of the poppy site was that it attracted a younger audience: 31% of visitors to poppy.org.uk were aged 18-34, compared with just 18% for the British Legion homepage.